Figure 7.2 ► The African Homo heidelbergensis specimen from Bodo, Middle Awash, Ethiopia. Figure 7.3 ► The African Homo heidelbergensis specimen Kabwe 1 (Broken Hill) from Zambia. later middle Pleistocene, perhaps around 300,000 years ago (Rightmire, 1990; Stringer, 2000a). Kabwe has a similar cranial capacity to Bodo at around 1285 cc (Holloway, 1981; Aiello & Dean, 1990), and they share quite a number of other similarities. 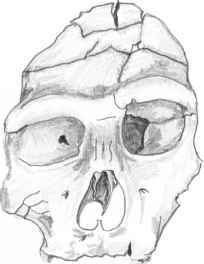 Kabwe 2 is a maxillary fragment; and from the same site come an innominate and limb bones. 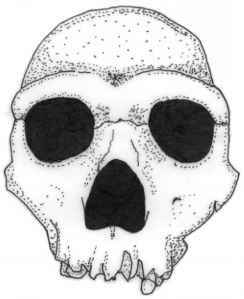 Other well-preserved African examples of H. heidelbergensis include the Saldanha calvaria, from the Western Cape; the rather gracile Ndutu cranium from Tanzania, about 400,000 years old; three mandibles and a parietal from Tighenif (Ternifine), Algeria, which may be as much as 700,000 years old; mandibles from the Cave of Hearths at Makapansgat (South Africa), Kapthurin (Kenya), and Rabat and Casablanca (Morocco); and a gracile facial skeleton from the Thomas Cave, near Casablanca. These extend our knowledge of the species' range of variation, and show that not all specimens are as robust as Kabwe 1 or Bodo — presumably a marked degree of sexual dimorphism is involved (Schwartz & Tattersall, 2003). 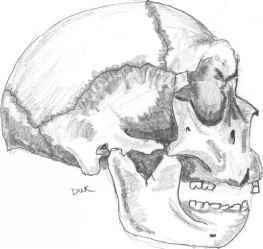 H. heidelbergensis is defined by a relatively large brain compared to its predecessors, a receding forehead that is placed posterior to the well-developed supraorbital torus, reduced facial prognathism, a large face puffed out as a result of its inflated frontal and maxillary sinus system, a robust mandible but no retromolar space (as seen in Neanderthals) with relatively small teeth, and no chin. In terms of its preserved postcranial anatomy, it is nearly completely modern in appearance, although more robustly built (Stringer, 2000a; Tattersall & Schwartz, 2000). Almost but not quite like H. ergaster, it had a robust pelvis with an accentuated iliac pillar (acetabulo-cristal buttress), and a femur with a thick cortex, its shaft narrowing to its minimum breadth just above the condyles. The earliest undoubted appearance of H. heidelbergensis in Europe is the type specimen, a mandible from Mauer, near Heidelberg, Germany. This key specimen, found in 1907, is thought to date to around 500,000 years ago (Stringer, 2000a). While the mandibular body is very robust, like that observed in earlier species of Homo, its molar teeth are relatively small, approaching that of later hominins. A near contemporary with Mauer is the robust tibial fragment from Boxgrove in England (Pitts & Roberts, 1998). It may be significant that both these two specimens, the earliest of the species in Europe, date to 100,000 years after the earliest appearance of this species in Africa (if Bodo is the earliest, but to 200,000 years if the Tighenif fossils are really 700,000 years old). Following on from these specimens are those from Arago in southern France, dated to around 450,000 years ago (Yokoyama & Nguyen, 1981), and Petralona in northern Greece, dated to perhaps 250,000-150,000 years ago (Grün, 1996). The fragmentary remains from Bilzingsleben in Germany, dated to around 400,000-300,000 years ago, and Vertesszöllös in Hungary, dated to around 210,000-185,000 years ago, are often said to resemble Petralona. If so, there is no bar to considering them representative of H. heidelbergensis (Stringer et al., 1979; Stringer, 2000a; Schwartz & Tattersall, 2002). As we suggested in the previous chapter, there also appears to have been a migration of this species into Asia, as represented by the Dali and Jinniushan specimens. Figure 7.4 ► The badly distorted Arago 21 Homo heidelbergensis specimen from southern France. the species was quite sexually dimorphic. The original describers of the Arago specimens referred to them as alternatively "anteneanderthals" or an advanced form of H. erectus, and they argued that they ultimately resulted in the evolution of the neanderthal lineage (H. de Lumley & de Lumley, 1971). Most today, however, accept these specimens as representing a European population of H. heidelbergensis (Hublin, 1985; Stringer, 1985; Tattersall, 1986, 1995; Rightmire, 1990; Stringer & Gamble, 1993; Howell, 1998; Schwartz & Tattersall, 2002). Figure 7.5 ► The European Petralona Homo heidelbergensis from Greece. African deme of this species gave rise to early H. sapiens, while a European deme of this same species, which we allocate to the "Steinheim group," eventually gave rise to H. neanderthalensis. If this is the correct phylogeny, some may ask what use there is in having a separate species for their common ancestor. 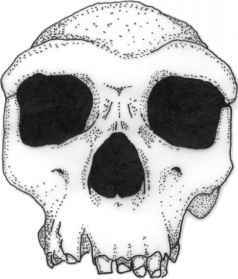 Why not put the European fossils into H. neanderthalensis and the African ones into H. sapiens? The answer is simply a matter of how to divide a probable ancestor-descendant lineage: The most objective way is not to make assumptions about who gave rise to what, but to recognize a separate species at the point where there are fossils that begin to exhibit, in however incipient a form, the uniquely derived character states of the descendant species — the point, in other words, where the phylogenetic connection can for the first time be clearly detected. This is the essence of the Composite Species Concept (Kornet, 1993). We tend to agree with Stringer (1983, 1985) that specimens like Petralona, Arago, Mauer, Kabwe, and Bodo show no specialized Neanderthal features, nor do Kabwe, Ndutu, and Bodo show specialized sapien features; so we retain them in a generalized stem species. 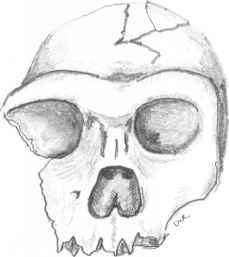 In Africa, of course, H. heidelbergensis lived in a tropical climate. While some of the European specimens are associated with a cooler-climate fauna, none, as yet, seems to have inhabited a periglacial environment, unlike the Neanderthals. It is quite a thought that each time the ice sheets swept down into Europe, the H. heidelbergensis population there collapsed, and the species became confined to Africa; and each time the climate warmed up again, Europe was repopulated from Africa. Only later did a new species develop that, for the very first time, was capable of surviving the extreme cold. When exactly this happened — when the proto-Neanderthals finally emerged — is something we will discuss later. Homo heidelbergensis is associated with a Mode 2 technology, which includes a large biface industry, including large flakes or cores shaped on both sides to produce "hand axes" (often referred to as Acheulean). This tradition has its origins with the later populations of H. ergaster in Africa around 1.5 million years ago. The earlier populations of H. ergaster, both the early ones of Koobi Fora and the contemporary deme in Georgia (if they can be considered representative of this species), maintained the more primitive Mode 1 technology (Oldowan). In terms of material culture, then, there is a clear continuum between the African ancestor, as defined by the late H. ergaster, and its descendant H. heidelbergensis, which occupied Africa and Europe around 1 million years later (see Foley & Lahr, 1997). There is evidence from Terra Amata, located within the city limits of Nice (dated to around 400,000 years ago), that H. heidelbergensis at least had the capacity to construct shelters. This site has long been considered as a seasonal occupation site, where humans built free-standing shelters, though there is still considerable debate regarding their status as real shelters (see Gamble, 1986,1999). These "huts" (if they are indeed such) were very large, measuring around 8 X 4 meters, and the construction is supposed to have been saplings embedded into the ground and bent toward the middle, where they were tied off. Inside the shelters is evidence of hearths, with considerable numbers of broken animal bones, showing that a diverse type of animal prey was consumed (Gamble, 1999; Tattersall, 1999). We briefly mentioned in the previous chapter that some specimens from the middle Pleistocene of China reflect a morphology similar to that of H. heidelbergensis (see Etler & Li, 1994; Stringer & McKie, 1996; B.A. Wood & Richmond, 2000; Stringer, 2000a). This is particularly true of the two southern Chinese Yunxian crania (dated to perhaps 350,000 years ago but perhaps a lot earlier), which are said to share a close phylogenetic relationship with the African specimens Kabwe, Florisbad, and Irhoud. But Groves has seen the Dali and Jinniushan crania (both dated to around 250,000), and they do certainly closely resemble their European and African contemporaries. When did H. heidelbergensis arrive in China, and how long did the species persist there? The date of Yunxian is uncertain, and the middle Pleistocene record of China is even spottier than those of Africa and Europe, so at present we cannot say. We can only observe that, at least at the time of Bodo (the earliest acceptable H. heidelbergensis in Africa or anywhere), Homo pekinensis was still in occupation of at least the northern part of China. Mode 2 technologies are well known from India, but eastern Asia is usually considered to have a long, unbroken history of simple Mode 1 technology (Cameron et al., in press). In some areas an Asian biface technology has been recognized (see Schick & Toth, 1993; Foley & Lahr, 1997), though the relationship of these biface technologies to those of Europe and Africa remains obscure, and further description and strati-graphic confirmation of these industries is required. It is even possible that these industries are separate, independent technologies. A number of hypotheses have been put forward to explain the absence of a Mode 2 technology in Asia. The first is that after the initial colonization of Asia by H. erectus there was no significant contact between Asia and the rest of the Old World. That is, the original colonizers left Africa/Europe before the development of a Mode 2 technology. The two technologies, that is, were species specific. Another suggestion is that when human populations arrived in eastern Asia, they became more reliant on the more readily available and accessable forests of bamboo; conversely, there may not have been a readily available and suitable raw lithic material to continue with a Mode 2 technology. Thus the stone tools of Mode 2 technology were substituted by tools of bamboo. And maybe, if the middle Pleistocene human populations had at most a limited capacity for language, passing the required skills on to the next generation was based on continuous practice and practical demonstration; and failure to keep up the mode, whether because of a lack of suitable raw material or for some other reason, quickly led to a breakdown in the continuum of Mode 2 technology (see Schick & Toth, 1993).